We awoke to a hazy sky and temperatures in the mid 20s. A lazy morning spent having breakfast and opening presents before catching the ferry over to Cadiz. 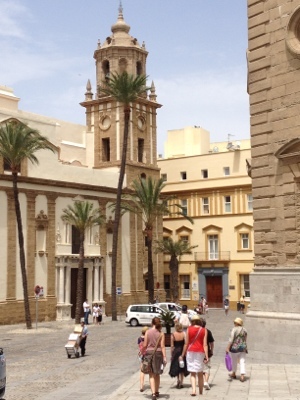 Cadiz is a beautiful city and apparently the second oldest inhabited city in Western Europe. We took a sight seeing bus around the city giving a a good view of the place without the hassle of walking everywhere. We introduced Liz’s mum and dad to tapas for lunch before heading our way back to the boat for Pimms followed by champagne. This evening we headed into Rota to sample paella with a couple of bottles of house wine for around €15 a head. Bargain. 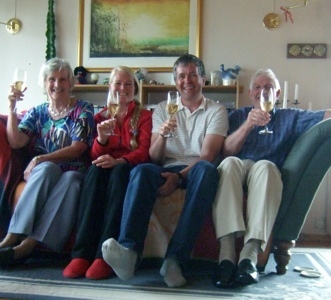 In the meantime the Norwegian contingent of the Wall family were celebrating Liz’s birthday without her!